The Astanza Trinity laser machine combines two powerful lasers – the Duality and the Eternity, for the most effective tattoo removal treatment for cosmetic professionals. Offering the choice of three powerful wavelengths and the most efficient level of energy production, the Astanza Trinity offers the strongest beam and the most innovative design for industry-leading tattoo removal and skin treatments. Unique to the Astanza Trinity is the dual-standalone laser design which results in the most powerful treatments and reliable services for your professional practice. The Astanza Trinity is an industry leader in multiple wavelength laser technology solutions that deliver safe, effective results for the most complete tattoo removal treatment. For practices that are looking for the most effective laser machine for powerful tattoo removal and skin treatments, the Astanza Trinity is a smart choice. Designed to completely remove stubborn inks, even when other laser systems have failed, the Trinity is highly effective on the darkest black inks and is also highly effective at getting rid of pigmented lesions and vascular lesions as well. The Trinity was designed with the most popular wavelengths found in tattoo removal and combines innovative laser technology with user friendly design that gets rid of even the most colorful tattoos. When compared with other tattoo removal system, only the Astanza Trinity offers the fastest fading of ink and complete removal of the design with the highest level of peak power of any system on the market today. 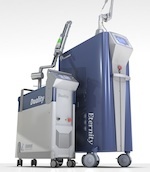 Interested in adding the Astanza Trinity laser system to your tattoo removal practice? SunrayLaser.com has great deals on used Astanza Trinity laser equipment with savings that are up to 60% off the original price! See for yourself how much you can save on high quality used laser equipment when you buy from SunrayLaser.com. Looking for pricing information and other details about our selection of pre-owned Astanza Duality equipment? Please fill out the form below and we’ll provide a fast and free, no obligation quote. It’s an easy and no-risk way to learn more about this outstanding line of tattoo removal lasers.